Campbell Robb has been Chief Executive of Shelter since January 2010 and has overseen the development and implementation of Shelter’s most ambitious strategy to date. Previously, he was the first Director General of the Office of the Third Sector in the Cabinet Office, responsible for leading the Government’s work with the Third Sector. Campbell joined the NCVO in 1998 as Head of Campaigns. He became Director of Public Policy in 2001, and was responsible for co–coordinating NCVO's external relations, policy and research work until 2006. Rebekah Carrier is a solicitor specialising in housing and public law at Hopkin Murray Beskine in Finsbury Park and has a particular interest in the allocation of social housing. Rebekah has acted for groups of tenants dealing with condition of their homes, planned regeneration, disrepair claims, possession and rehousing. She acted in a case for Southwark Law Centre which ensured continued access to legal representation for thousands of tenants threatened with homelessness. She writes regularly on housing and legal aid issues. Rebekah is currently instructed in a number of high profile cases challenging the “bedroom tax “and benefit cap welfare reforms. 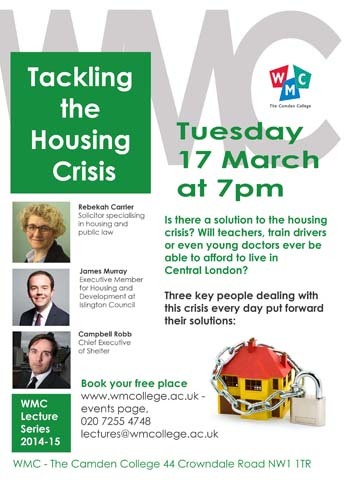 James Murray has been the Executive Member for Housing & Development at Islington Council since 2010. In 2011, James made Islington the first local authority to reject the Government’s plans to raise 'affordable' rents, and launched a major building programme of homes for social rent instead. James has also led moves to impose penalties on ‘buy-to-leave’ investors and to stop private landlords renting out sub-standard 'shoebox flats’. He has been a strong advocate for the direct delivery of council services, having brought in-house over a thousand staff including repairs contractors. Before joining the Council’s Executive, James worked for Islington South & Finsbury MP Emily Thornberry, where amongst his projects he assisted in drafting a private members bill to give tenants greater control over housing associations.